The question over choosing the right go-kart chassis boils down to flexibility. High traction tires and a stiff frame is a recipe for disaster, causing your machine to turn stiffly and generate strenuous effort on the curves. Low traction tires will cause uneven weight transfer and break apart your frame like bread crumbs. 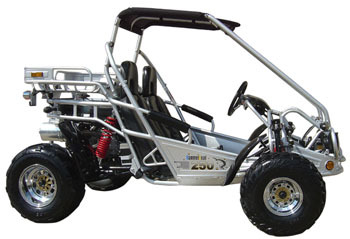 Options for frames mainly depend on what type of go-kart you're riding, as each go-kart and their engine work best under certain scenarios. Stiff frames are a staple of 2-cycle and 4-cycle engines and flexible frames are found with higher horsepower engines. Remember, the more rigorous the circuit, the more flexible a chassis should be!